Wall-E sees the small waste compactor bot doing what he was designed for on a futuristic Earth where humans have left. It’s a lonesome life for him until he meets EVE, a high tech search robot, who’s on the hunt for signs of life. In a clever twist, John Carter’s Andrew Stanton directs and co-writes a story that plays out like a silent movie, taking influence from some of Pixar’s famous shorts, with little more than a few words spoken and most of the plot being explained through the characters actions. Ben Burtt leads the cast as Wall-E, but most of his dialogue is altered to sound closer to small beeps and electronic sounds. Most of his personality comes through his body language, which Pixar has been perfecting since the short Luxo Jr. His character is innocent and grabs your attention as soon as he appears. After his long-term solitude, he’s developed a personality in which he’s curious about what he finds. He still does his job, but he collects small trinkets, such as an unfinished Rubix cube, a spork and lightbulbs. He’s a great character and really stands out from Pixar’s gallery of colourful creations. Elissa Knight provides the voice for the much smoother EVE, who’s a much more advanced and high tech robot compared to Wall-E. Her character is much more graceful and calmer, but isn’t afraid to blow things up, if need be. She is a well written character and her relationship with Wall-E is more believable and touching than most live action romantic films. The movie acts as a two part story, with the first following Wall-E as he cleans up the planet, and the second following the human race aboard their space station as the movie becomes a fully-fledged sci-fi. 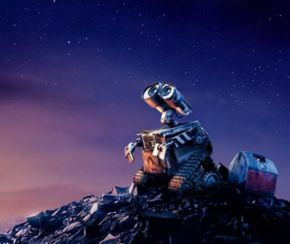 It’s a shift in tone that doesn’t always work in movies, but Pixar manages to find a way for the story to continue in a believable way that the change doesn’t stick out or feel jarring, by keeping the focus on the robots. Set aboard a ship called the Axiom, Wall-E discovers where the human race has been staying for the past 700 years, in that time they have become far too reliant on technology to the point where they never leave their hover chairs, have become morbidly obese and have a holographic screen constantly in their face. It’s a slightly disturbing idea of what the future may hold, but Pixar manages to find the right way to tell it, and offer a small nugget of hope. The animation is some of Pixar’s best to date, with all of the materials looking realistic, including the reflections on the robots. The lighting looks fantastic and interacts with the environment in a believable way. A highlight is a beautiful dance between Wall-E and EVE in the weightlessness of space around the Axiom. One detail that Pixar added was the use of camera lens focus. They had touched on it before with The Incredibles, by shifting the audience’s attention, but with Wall-E, they add extra blur when needed to give a few scenes and almost found-footage look, such as when Wall-E is chased by runaway trolleys. The sound design is incredible and was an amazing step-up for Pixar. Everything from the dust storms to the small details of Wall-E’s home sounds real and fleshes out each scene with so much detail. Unlike most of Pixar’s movie, the first half relies heavily on the music to help the audience understand what the characters are feeling. It is created by The Green Mile and Finding Nemo composer Thomas Newman, who balances the two sections of the film extremely well. Most of the music for Wall-E’s character is quite small and quiet, but that theme gives way to something bigger and grander as he leaves the planet. From there the theme sounds a little more high tech, but still focuses on the main characters. Being a Pixar movie, the films contains a short called ‘Presto’, which shows a magician locked in a slapstick battle with his hungry rabbit. It is comedy gold that would make Tom and Jerry proud. It’s animated brilliantly and the best remedy to a bad day. Overall, this is a perfect film that shows just how good the team at Pixar is at crafting a compelling movie with lovable characters that everyone can enjoy. This is one of Pixar’s best movies. Purple Revolver rating: 5/5. Another heart-warming Pixar masterpiece.